Using his executive powers, Harry S. Truman declared a “limited” National Emergency on December 16, 1950 under the perceived threat of communism spreading throughout the globe via North Korean forces. 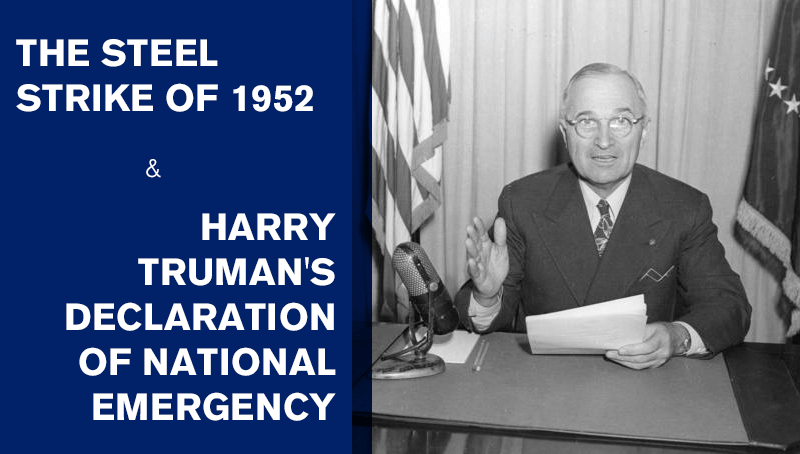 Now, THEREFORE, I, HARRY S. TRUMAN, president of the United States of America, do proclaim the existence of a national emergency, which requires that the military, naval, air, and civilian defenses of this country be strengthened as speedily as possible to the end that we may be able to repel any and all threats against our national security and to fulfill our responsibilities in the efforts being made through the United Nations and otherwise to bring about lasting peace. As the Korean War raged on, on the home front, the American steel industry began its own battle over wage increases. On April 8, 1952, Truman took matters into his own hands arguing that steel worker strikes and standoffs between the steel companies and the unions could not persist during wartime. Truman issued Executive Order 10340 giving full control of the steel industry to the Secretary of Commerce for the purposes of wartime production. Thus, Truman attempted to nationalize the steel industry. 1. The Secretary of Commerce is hereby authorized and directed to take possession of all or such of the plants, facilities, and other property of the companies named in the list attached hereto, or any part thereof, as he may deem necessary in the interests of national defense; and to operate or to arrange for the operation thereof and to do all things necessary for, or incidental to, such operation. Tonight, our country faces a grave danger. We are faced by the possibility that at midnight tonight the steel industry will be shut down. This must not happen. Steel is our key industry. It is vital to the defense effort. It is vital to peace. Read Truman’s full address here. Truman’s Executive Order nationalizing the steel industry on the basis of necessity for wartime production resulted in the Supreme Court’s involvement. At the time, no formal law existed to provide the precedent for Truman to nationalize the steel industry. Despite Truman’s argument that his position as commander-in-chief afforded him the power to make all military decisions (which it technically did), the Supreme Court ultimately ruled that Truman lacked the constitutional authority to nationalize the steel industry despite the ongoing state of emergency declared by Truman two years prior.